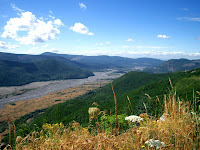 I hiked Mount Saint Helens in Washington State (United States of America) on 12 September 2005 in company of Ruth to see for the first time the site of a devastating volcanic eruption. We drove a few hours from Seattle, visited a museum dedicated to the 1980 eruption then walked for a while in the area. In some places vegetation was non-existent, dead trees killed by toxic fumes stood still, and animals were scarce. Ruth was a great companion for the hike as she is my preferred geologist and a former NASA employee.